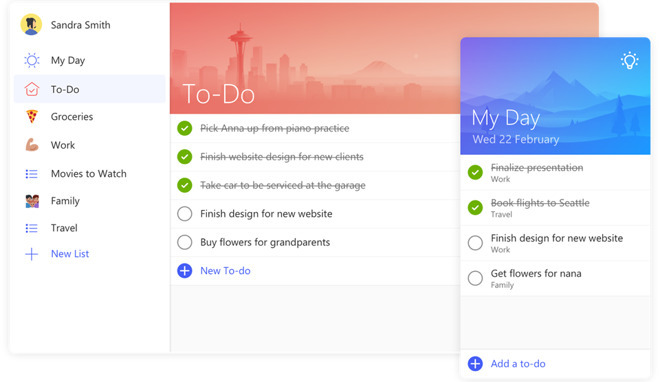 Microsoft on Wednesday released the first edition of To-Do, an app that will eventually replace the popular multi-platform title Wunderlist, which it acquired back in 2015. To-Do is currently available in preview form for iPhone, Android, Windows 10, and the Web. Mac and iPad versions will follow in the future, Microsoft said. The app borrows many of the core concepts of Wunderlist, with options like reminders, due dates, and notes. Lists can be given their own visual themes though, and a key addition is the "My Day" view, to which people can add automatically suggested items, such as upcoming to-dos or unfinished holdovers. As is common with many Microsoft apps, To-Do hooks into Office 365. Currently this is limited to sync with Outlook tasks, but Microsoft noted that it plans to expand integration later on. Further updates will include integration with other Microsoft services, and more features carried over from Wunderlist, such as list sharing. The To-Do introduction marks the beginning of the end of Wunderlist, but Microsoft is offering a tool for importing data, and promising that it won't sunset Wunderlist until To-Do has incorporated "the best" of its predecessor. The company bought Wunderlist developer 6Wunderkinder in June 2015. The deal was estimated to be worth between $100 million and $200 million.